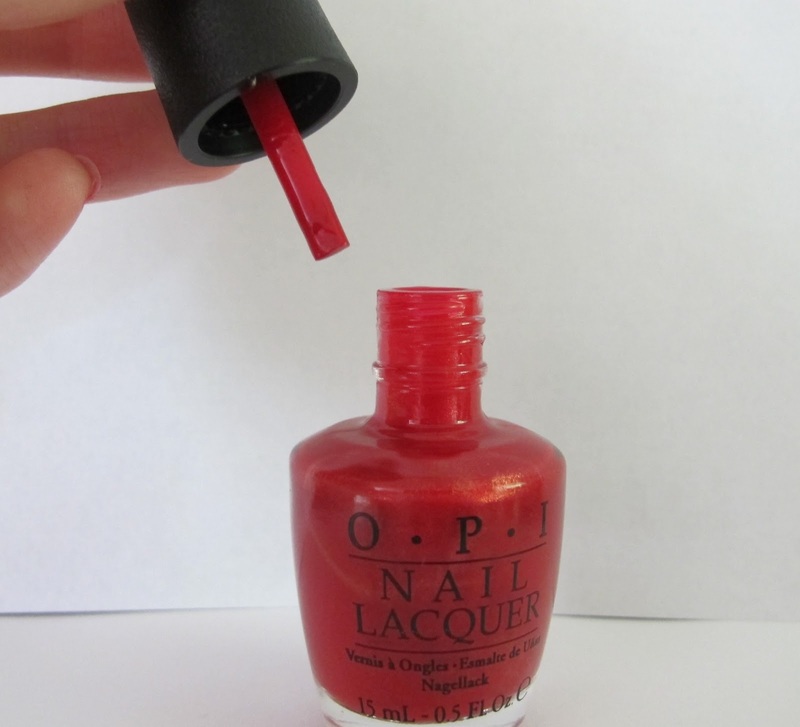 I have swatches of the lovely OPI Couture de Minnie collection today. For a collection of all reds and pinks, I was strangely excited about this! Couture de Minnie has a creme, two shimmers, a glitter and a Liquid Sand. That's a nice variety of finishes for a small collection. 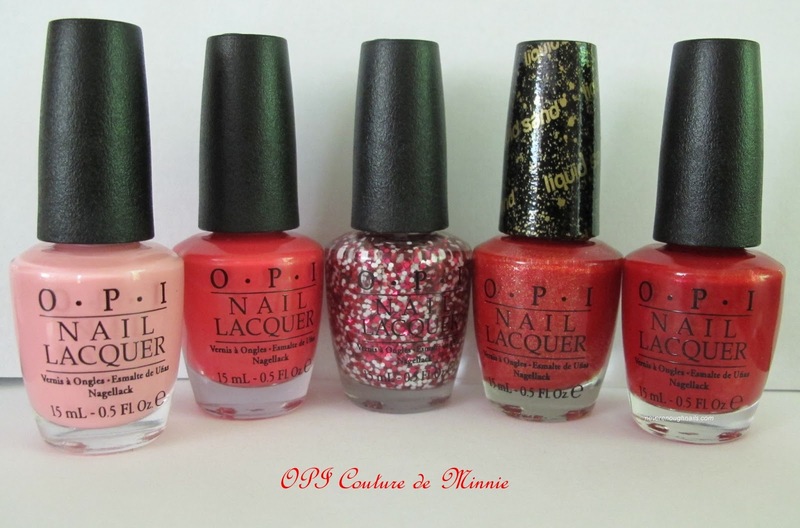 The OPI Couture de Minnie collection was sent for review. All opinions are my own honest thoughts. OPI Chic From Ears to Tail is a bubblegum pink creme. I thought this would be a dupe for OPI Pink Friday, but Pink Friday is surprisingly a lot lighter. This kind of bubblegum pink is not the most unique color, but everyone should have a pink like this in their personal collection. It's a classic, but also a fun color. I did need three coats of Chic From Ears to Tail for full coverage and to even out any streaks. I did experience some streaking with the first two coats, but the third coat evened it all out. OPI Minnie Style is a mixture of red and white hex glitter in a clear base. 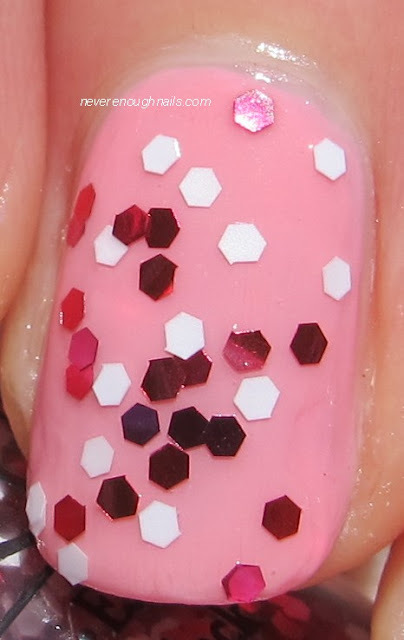 The hex glitters are all the same size, so it makes kind of a graphic look on the nail. 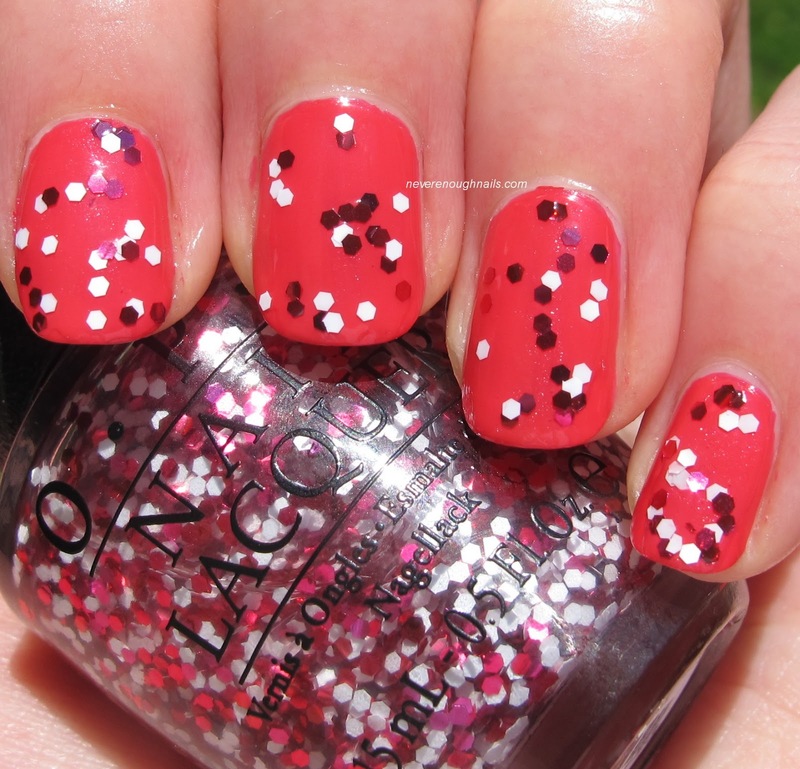 Minnie Style is the polish that most reminds me of Minnie Mouse. It looks kind of like red and white polka dots! For the above pictures, I layered two coats of Minnie Style over Chic From Ears to Tail. Below, I used two coats over A Definite Moust-Have. Minnie Style was a little bit hard to apply. If you use regular brushstrokes, the glitter doesn't really stay on the nail. I found dabbing to be the best method of application. The glitters wanted to all bunch together instead of spreading around evenly, so you may need to shove them around a bit. This is two dabbed coats. OPI A Definite Moust-Have was described as a "fantastic fuchsia", but I think it leans towards the coral end of things. It's less blue-leaning and warmer than a lot of fuchsia polishes. It has some pretty delicate shimmer that doesn't jump out at you, but helps add dimension to the polish. I can totally see myself rocking this color a lot this summer! A Definite Moust-Have was easy to apply and highly pigmented in just two coats. It has a lovely buttery formula, the perfect consistency. 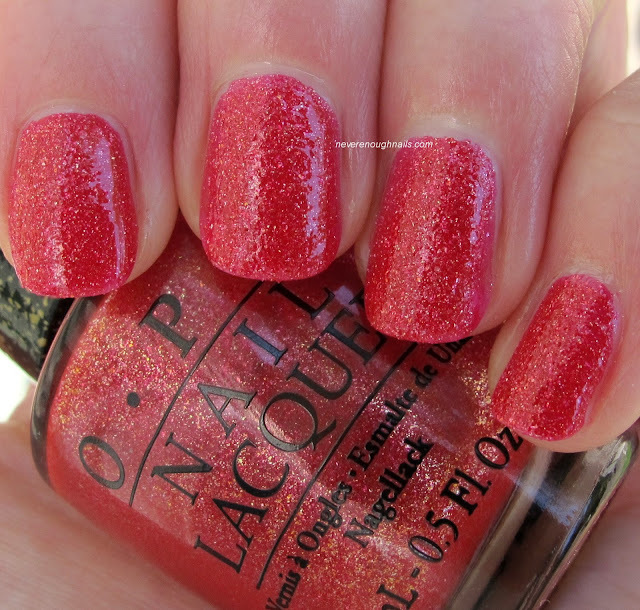 The lone Liquid Sand in the collection, OPI Magazine Cover Mouse, is absolutely stunning. I LOVE this polish! 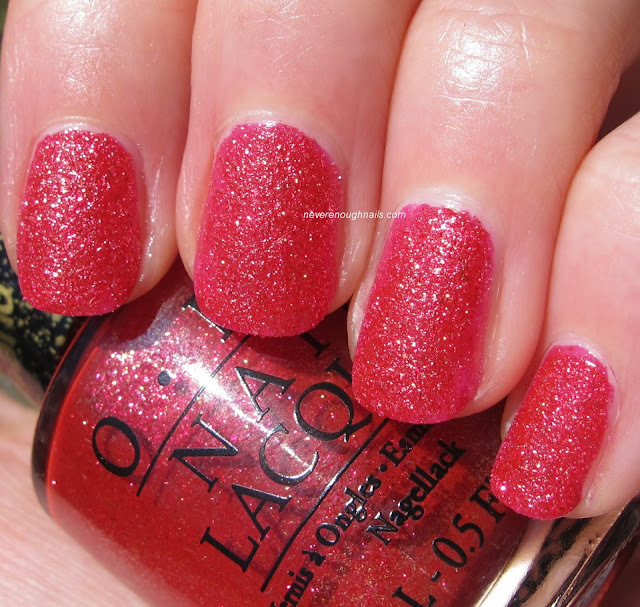 OPI called it a "headline-making strawberry" that "has a sparkling texture". Strawberry is pretty accurate, it looks delish just like a strawberry LOL. If you're wondering how this compares to OPI Jinx, it doesn't. Jinx is way more orange-y coral with very golden sparkle. Magazine Cover Mouse is a more true red with gold sparkle, but it doesn't look as gold as the sparkle in Jinx. This is two coats of Magazine Cover Mouse, but it was almost completely opaque in one. When I wear this as a full mani this week, I'll be wearing one thicker coat. I'm excited about owning a one coat texture polish that dries fast. OPI's Liquid Sands wear for about 5 days on me with no chips and minimal tip wear, so this will be perfect for really busy weeks. The formula was great and super easy to apply too! Below is MCM with one coat of Gelous. It's gorgeous shiny too! If you hate textures, you can definitely still get this to wear with top coat. It was pretty smooth with on thick coat of Gelous. Mine came like this! I've heard of this happening, but I've never actually seen this. I will post a review and swatches of this as soon as I grab a replacement cap with a brush! My favorites from this collection are Magazine Cover Mouse and A Definite Moust-Have. I also really like Minnie Style (I want to wear it over blue for 4th of July!!). Are you interested in any of the Couture de Minnie pretties?? OPI Couture de Minnie is limited edition and will be available beginning June 2013 at professional salons, including Beauty Brands, Beauty First, Chatters, Dillard’s, jcp Salons, Pure Beauty, Regis, Trade Secret, ULTA and ulta.com for $9.00 ($10.95 CAN) suggested retail for each nail lacquer.